The white light emanating from an LED lamp is produced by blue LED die to excite the yellow phosphor on top of it. Different spectra of white light will vary with different CCT (Correlated Color Temperature), and the CCT can be altered by changing the chemistry of yellow phosphor. 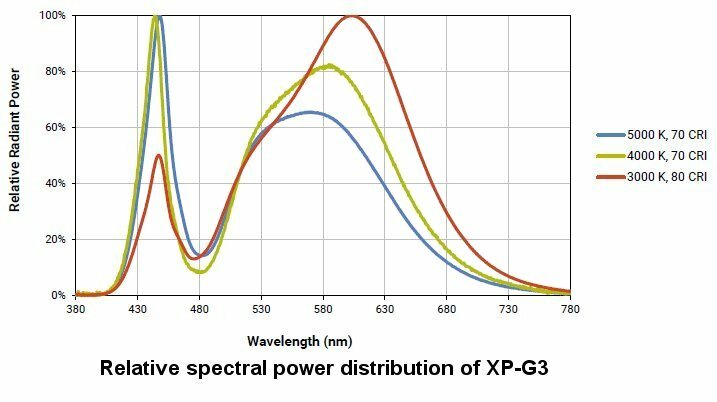 Below graph illustrates the relative spectral power distribution of Cree XP-G3 LED lamps, and it clearly demonstrates that the spectrum of white light is not a homogenous mix of wavelengths. The radiant power of blue wavelength (450 nm) for cool white (5000K CCT) is double of the warm white (3000K CCT). This is because cool white light emits more blue wavelengths and less red wavelengths, hence it is perceived by human eyes as cooler or "bluer". Warm white light has lower CCT than cool white because its output contains more red wavelengths and less blue wavelengths.